Designed by Ivan Schlapobersky and Mary Craig of M Architects, the building’s graphic black-and-white exterior mirrors its sleek, modern interior, which was dressed by Greg Gamble, Philippe van der Merwe and Alicia Beetge of Johannesburg-based Tonic interior design and bespoke furniture specialists. 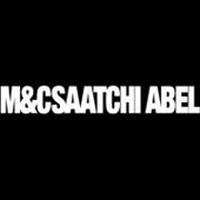 Key to the design brief was the fact that the Saatchi brand is synonymous with an inherent love of art – original Founder Charles Saatchi opened his eponymous London gallery in 1985 to exhibit his vast personal collection to the public. 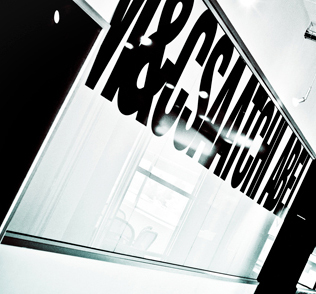 “The directive was first and foremost to produce a gallery-style space in which to house the agency’s own extensive collection of South African and African contemporary art, which has been built up over the years by its Founder, Mike Abel,” says Gamble, adding that the predominantly black and white palette (which is in line with the agency’s corporate identity) would be enlivened with pockets of well-considered colour and a touch of “British cool”. The agency’s fundamental belief in the role of art as important to inspiring, challenging and building creative and original thought is conveyed in the gallery-like ground-floor reception area and then filtered through the remaining three storeys. Here works by the likes of Mohau Modisakeng, Cyrus Kabiru, Colijn Strydom, Sam Nhlengethwa, Kudzanai Chiurai, Jody Paulsen and Julia Rosa Clark add colour and texture to the predominantly white spaces. On the first and second floors the executives, creative teams, admin departments and relaxation areas are deliberately mixed in order to encourage interaction between all staff. The third floor, meanwhile, houses the executive boardroom and lounge-dining room as well as a rooftop entertainment area with iconic treetop vistas over Saxonwold and Houghton. The designer explains that, during the construction phase, it was decided by the team to expose the clean undersides of the building’s trademark concrete slabs as far as was possible. “The challenge, then, was to keep all the usual services hidden away in the remaining ceilings and bulkheads,” he notes. Linear black suspended light fittings were introduced to wash light onto these concrete soffits, highlighting their raw, sculptural quality. This is contrasted with crisp white walls and ceilings and black aluminum internal shop-fronts. “We added white oak paneling to soften strategic areas and then accents of intense colour in the pause areas that are scattered around each floor. For the latter, we went with varying shades of one bold colour in each,” says Gamble.